Since 1992, Paranoia: The Conspiracy & Paranormal Reader has presented alternative views and marginalized theories of the inner workings of the cryptocracy. Subjects include conspiracy theories, parapolitics, alternative history, and the paranormal. 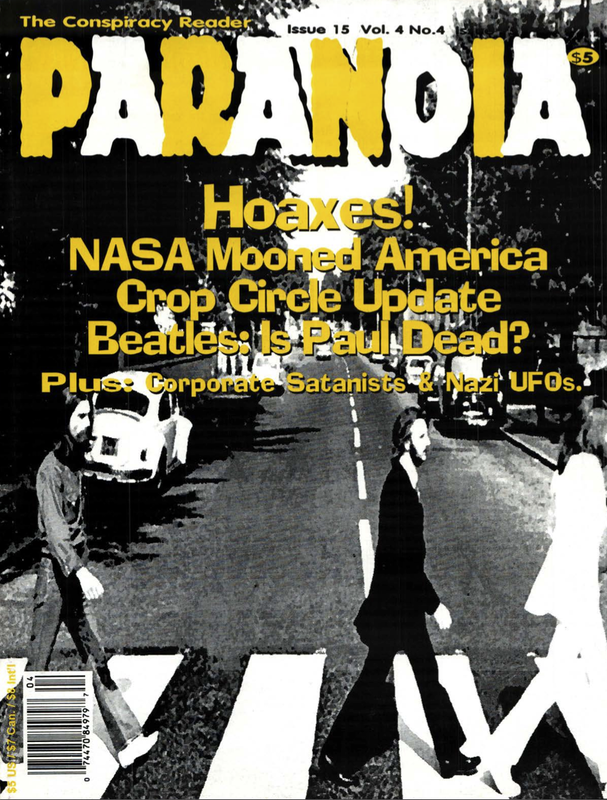 Paranoia was founded during the zine explosion of the early 1990s. The first issue had a black-and-white tabloid-style layout, with feature stories starting on the cover and continuing inside. Over the years, Paranoia evolved into a 72-page print magazine published three times a year, with a print run that reached 15,000 copies. It was sold on newsstands throughout the U.S., the U.K, and Canada, as well as to subscribers. In 2011 independent publisher and well known MK researcher Ron Patton brought the magazine back after an almost three year hiatus, publishing some of the most edgy and in depth research articles in Paranoia’s history. In 2015 independent publisher and well known MK researcher Ron Patton teamed up with Paranoia writer and Publisher Olav Phillips to move Paranoia forward even more launching a podcast, new books and relaunching the website. How did I miss the ‘new’ Paranoia? So I just got the latest 5 – now I’m going to become a lot smarter. Can I still subscribe to P/M and receive a print copy? We current distribute our quarterly issues in a digital format but we will be printing a compendium book of all the years issues in December. Currently we are planning to print 2012, 2013 and 2014 compendiums this December. Thank you for you response. As a long time reader I have missed reading the issues since the magazine went silent a few years ago. Personally I like the print magazine, however if online is all there is available then ill just buy the compendium . I will surely miss the print version. Hey what happen to your store? Did you move locations? I was really looking forward visiting your shop. My name is Tim. I live in Albany Oregon Area . I used to live in east Portland for 25 years . I have been a Conspiracy researcher for many years .I am a real Nerd in that area . I look at many sources and try to sift through disinformation. I do not discriminate claims of others But I try and get to sift through as n much of the evidence as I can. I have connected a lot of the dots .They all seem to come together for me personally .Lots of dots .LOL If your interested ? I would like to pick your mind .And perhaps there could be some free bono stuff I could help with? I am just wanting to get information out as best I can to inform the public. I do have a lot of self education in history and in biblical scholarship. The truth (its always an on going thing? )But as fat as I have discover? (undercover covert?) is far stranger than fiction? .I think you know what I mean?